The process of retail buying is messy and unpredictable. There are, however, some buyers that have found great success doing this kind of work. We wanted to find a way to make all buyers great buyers by figuring out what qualities this individuals have and then creating a tool that would allow other buyers to take on some of the actions associated with these great buyers. This was a client sponsored project, so we needed to take into account how our product would fit into their business model. This limited us to some extent because it meant we had to do something that fit into a a previously existing tool of theirs. We were also fairly limited because retail buying a such a specific role that both being able to find these people as well as convince them to speak with us was very challenging. We interviewed 22 buyers to learn more about the buying process and breakdowns within that process. Some of these users we were able to interview in their work setting while others we met in public. From all of these interviews we created a concept map, a journey map, and an affinity diagram that measured about 96 square feet. We had a lot of material to draw from, and this was good because it meant that all members of the team were able to establish a general knowledge around this space and this role. From our interviews with buyers who had found success in their work, such as senior buyers, category managers, or DMMs (divisional merchandising managers) we were able to draw out three insights relative to the process of a great buyer. The first insight is that these buyers are able to look at data (think excel spreadsheets) and pull out the patterns and trends from the data to tell a story about their buys for the season. The second insight we had was that great buyers are able to manage unpredictability really well. They are always prepared to react if one of their buys doesn't work out. The third insight is that great buyers are always learning from their past work as well as other buyers around them such that they are constantly improving. We had a number of design ideas moving into the ideation phase of the project. There are so many breakdowns relative to the buying process that is wasn't hard to come up with potential solutions. The problem here was more so finding the best solution -- the one that would make the biggest impact on the buying process. 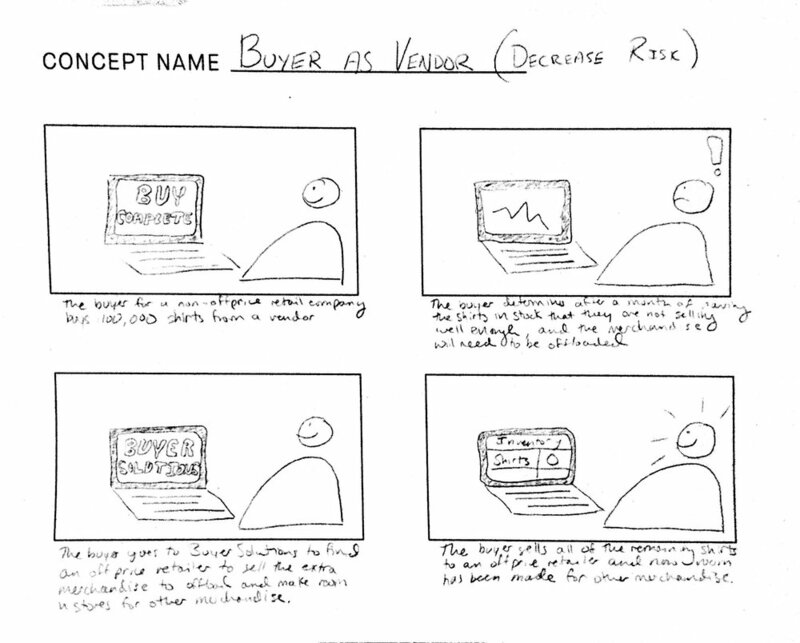 One idea we had, and you can see it in the storyboard, is to minimize the risk that a buyer takes on when they make a purchase by allowing the buyer to act as a vendor when products are not selling as well as the buyer had hoped. They can sell to other buyers representing off-price retailers, such as Marshalls or Ross, and they get rid of the merchandise. While this concept tested well with users, the reactions were not strong enough to pursue it further. Another idea we had was to gamify the buying process by having teams within the buying team, and those teams that perform the best over a season are rewarded in some fashion. This encourages buyers to learn from one another and help each other make good choices relative to their buys. We heard from one user that their company already did this, and that it was fun. We determined that this idea would not have as big an impact as we wanted, and thus we ultimately ended up abandoning it. We figured if one user already had this at their company, then certainly other retailers would too. We wanted to make something that didn't exist yet, but would drastically change the way that buyers operate. One of the user testing rounds we had an idea for an ambient display in a shared space of the buying team. The ambient display would show pictures of the products across the retailer, perhaps those that were top performers, and show the metrics relative to those products so that other buyers could see what products were working as well as engage the buyers responsible for these purchases to learn from them. Users responded extremely well to this idea, but it wasn't the ambient display itself that users were drawn to. We discovered after more testing that it was the visual that buyers were drawn to because so many didn't have the ability to see their products once purchases were made. We ended up running with this idea and began iteration here. We had quite a few iterations of prototypes and every week we would have at least 2 users look at the prototype and provide feedback about how this might fit into their workflow and how valuable certain features are. While we pursued a visual product, that is incredibly vague and could be applied in a number of ways, so we tried as many ways as we could and were, most weeks, able to get multiple designs in front of users for their feedback. The paper prototype here would have been an assortment visualizer such that the buyer could see larger patterns relative to style and color across the assortment relative to those attributes that appears to yield top performance for products. For example, silk is listed here as a top performer. The buyer can see from the cluster of products all the silk top performers as well as derive other trends at a visual level from this grouping. We decided we didn't want to just focus on one part of the buying process. We wanted to cover as much as possible. We built a tool that would allow buyers to manipulate sales data, just like an excel spreadsheet, but be able to see a picture of the product with the data. This may seem like a trivial addition, but we can assure you from our user testing that it is most assuredly not. Buyers do not have a tool to actually see the products when they are looking at the data. All they have is the SKU relative to that product. To compensate for this lack, sometimes buyers at actually going on their own retailer's e-commerce site just to see the product that they are reviewing the performance of. There are attributes relative to the product listed in the spreadsheet of data, but this provides a highly impoverished depiction of the product and buyers simply don't find any value in it. The tool provides all the functionality of a spreadsheet of data along with the pictures. The buyer can write comments about the specific view they're looking at and save it for future reference. The buyer can also set alerts for themselves such that they are told when a certain threshold has been met for a certain product and a certain metric. For example, a buyer may want to know when sellthrough for a certain product exceeds 75%. The buyer would be able to set an alert to be notified when the sellthrough exceeds this percentage. There is an art and a science to retail buying. Buyers need to be good at manipulating data, but they also need a keen eye for products. The tool we build covers both arenas. We hope that users have an easier time looking at data with the assistance of visuals. We believe that it will help users be much more efficient so that they can spend more time building the best assortments and being the best buyers that they can be.